I’ll get to test recursive or wildcard querying in U-SQL. I’ll get to see if the subfolders named for the log year are good idea by how messy #1 is. I’ll have some profiled data I can use when I start my analysis queries. I know from past experience that one of the columns in a log file is the byte size of the resource being requested, but not all resources have a byte size (like a default route URI). In this case the server stores a “-” instead of a numeric value. This would break my analytics unless I handled this situation. I’ll see if saving results to a flat file in an output folder is a good idea, or if I should switch to database tables. Profiling is an intensive task, and sometimes it’s good to offload objects in memory, or run in parallel. In either of these cases outputting to a flat file isn’t always the best idea. Before I start any profiling, I need to get my log data out of my files and into a consolidated dataset. That’s the focus of this blog post, the actual profiling will start in the next post. First thing I’m going to do is get data from just one hardcoded file. If I know one file works, I always have a fallback if things are being wonky. 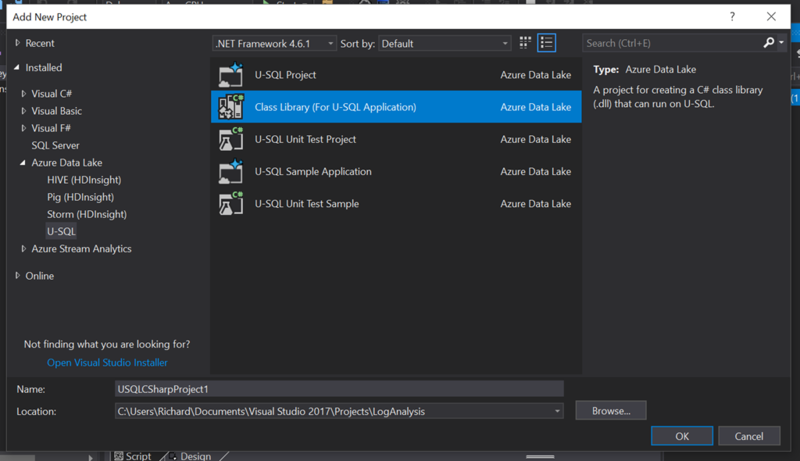 The Azure Data Lake Explorer in Visual Studio (not to be confused with the Azure Storage Explorer I mentioned previously, which is a standalone application) has several useful functions on its right-click menu. When I drill down to a file, I can Preview the first 100 lines, which will give me an idea of how the U-SQL EXTRACT function will interpret the file with zero work on my part. The second function is creating that EXTRACT script, which I can use as-is or tweak to suit my needs. With just a click of a button, I get this, and I can see how the files will be processed. Apache server logs are sort of space delimited, but not really. This is why they’re so hard to process is the standard tools. For instance, the timestamp is wrapped in square brackets, which a space between the time and offset. This results in Column 3 having the date and time, plus a leading “[“, and Column 4 with the offset and a trailing “]”. Also, the method, URL and protocol are all quoted in the log file, so they end up in the same column, Column 5. Since this log is for a blog hosted on a shared server, I don’t have control over the file format, but the challenges are what makes this project fun. To get useful data, I’m going to have to clean up and reassemble the timestamp, and also split apart Column 5 into its components. This is exactly why I have a raw ad a transformed zone in my storage–I don’t want to have to do these (and other transforms) in the query every time I want to run some analysis; I’d prefer to run my analyses against the transformed data. Extending U-SQL Expressions with User-Code), and maybe I’ll do that later on. The temptation would be to run analyses against the raw data and use the UDF to basically create an in-memory transformed zone when I am running analyses. I think I’d still want the transformed later and save on the CPU cycles and memory usage. 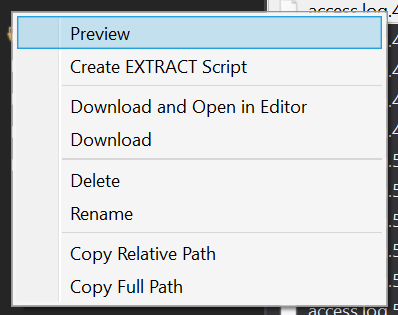 The File Preview also has a “Create EXTRACT Script” button, which opens the EXTRACT Script Builder. Here I can change column names and adjust types. Note that the preview and column type inference is only the first 100 characters, and some excitement probably lurks (which is why I’m profiling in the first place). Column 7 is the byte size of the requested URL, which I know to be a possible problem spot. The script builder interprets this as an integer, but scrolling down a few lines my suspicions are confirmed. Two entries have a byte size of “-“, which won’t parse correctly. At this exact moment I can’t decide if I want to convert “-” to zero or null (zero will be counted in averages, null won’t) so for now, since I’m just building a profiling script, I’m going to type this as a string and deal with it after I analyze my profiling. Now it’s time to profile my selected file. 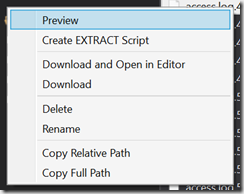 This extract script is being generated to run against the one file I selected to preview, so later on I’ll still need to work in wildcards or recursive queries. As a getting started, one file is perfect. I Submit the script, and success! But that’s only one file. How to process all of my logs? This could not have been easier in U-SQL. All I had to do was change the FROM to read as below, and every log file in both folders was processed into one @input. I did not have to make lists of subfolders, then loop through the subfolders and read files one at time like we have to do in C#. U-SQL handled everything for me. I can start querying the whole dataset now! Your mileage may vary based on how much data you have, but this works for me for now. For a little more information about using files and filesets, see Files and File Sets as Inputs and Outputs (U-SQL). I’m fascinated by data lakes, and the analytics they can power. If not done well, you can end up with a data swamp (see http://rjdudley.com/prevent-swampification-in-your-data-lake/). 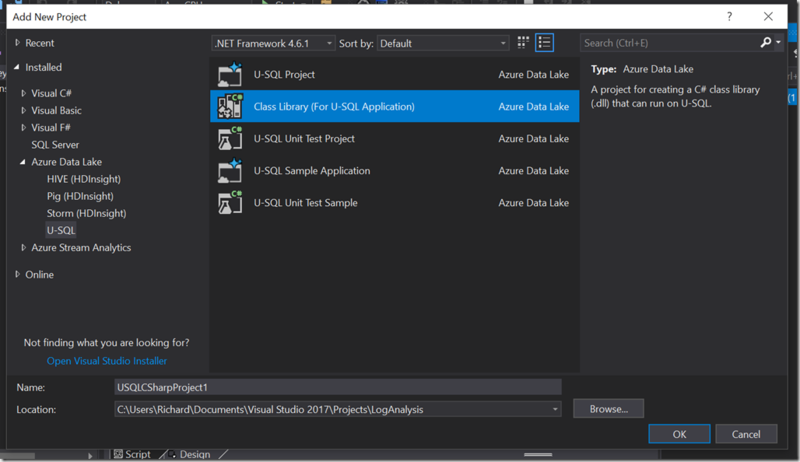 I love what Microsoft is doing with the Azure Data Lake, and the storage, analytics and U-SQL components. I’ve been looking for an excuse to work with it, and I’ve been interested in better ways to analyze website logs. I’m writing these blog posts as I build out the data lake, so they may wander or things may change as I progress. We’ll see how this works out. First things first–setting up your storage. With a data lake, you have the option of just throwing everything into one heap, but that’s not a great idea. This would leave us trying to do analysis directly against raw data, and having to account for any data quality issue or conversions in our analysis queries. Over time, the format of our raw data may change, adding a layer of complexity to these queries. Natural lakes have different zones (see http://www.lakeaccess.org/ecology/lakeecologyprim9.html) based on temperature/light/nutrient characteristics, so if we’re extending the lake metaphor, data lakes should also have a number of zones. While traditional data warehouses are designed for ETL (extract, transform, load), data lakes are designed for LET (load, extract, transform). I’ll follow the LET pattern and have a raw “zone” (actually a folder) where we land the log files, use U-SQL for the extraction and transformation, then store the results in a transformed “zone” (again, just a folder). At least that’s the initial idea. Since this project is small scale I can use simple folders, larger data may need a different strategy. Another complication is that my host names the files by week-of-year, but no year, so within 52 weeks I would start overwriting files. I have a couple options here–I could prepend a year onto the filename when I load it, or I could load the files into folders named by year. Since this is small and I’m manually uploading files, I’m going with subfolders in the raw zone, named for the year. This may change later as I automate the load process. Fortunately I can rearrange the raw zone with some PowerShell scripts or the Azure Storage Explorer. Again, YMMV, so I highly recommend burning every penny of Azure credits you have until you figure out the best strategy for your needs. Now that I have my two zones, plus raw subfolders, and the log files for the last few months uploaded it’s time to start the E and T.
Data lakes have emerged as a promising technology, and continued advances in cloud services and query technology are making data lakes easier to implement and easier to utilize. But just like their ecological counterparts, data lakes don’t stay pristine all on their own. Just like a natural lake, a data lake can be subject to processes which can gradually turn it into a swamp. 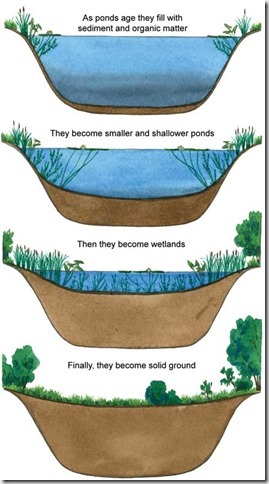 In the biological world, all lakes become swamps over time without intervention. 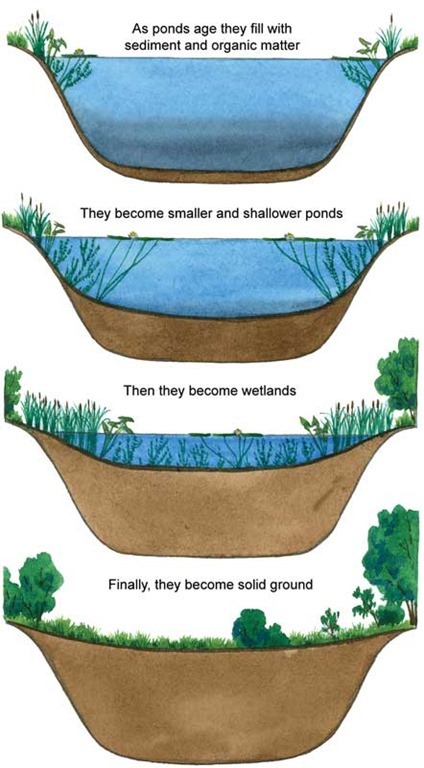 This process is referred to as “pond succession”, “ecological succession”, or “swampification” (my favorite). This process is largely caused by three factors: sedimentation (erosion of hard particulates into the lake), pollution (chemicals which shouldn’t be there), and detritus (“decaying plant and animal material”). 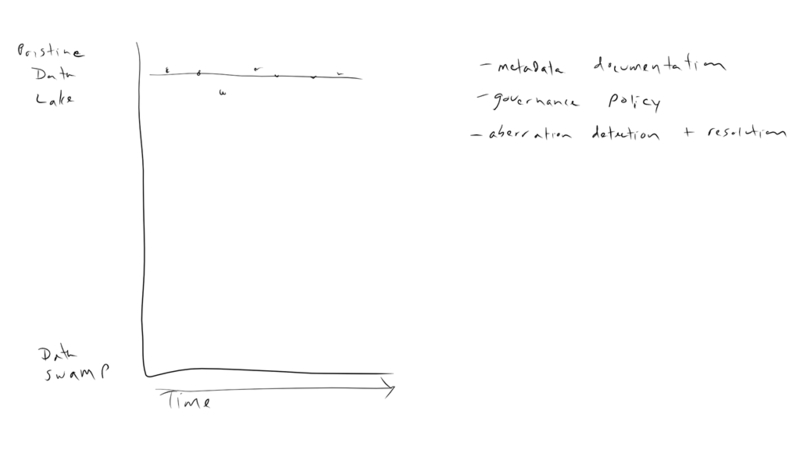 Visually, the process resembles the super slo-mo diagram below. Swamps are ecologically diverse systems, but they can also be polluted and rancid breeding grounds for disease. Because of this, they can be generally undesirable places, and a lot of effort has been expended to keep pristine aquatic systems from becoming swamps. A data lake contains data from various sources. However, without proper management and governance a data lake can quickly become a data swamp. A data swamp is unsafe to use because no one is sure where data came from, how reliable it is, and how it should be protected. With data lakes, it’s important to move past the concept that data which is not tabular is somehow unstructured. On the contrary, RAW and JPG files from digital cameras are rich in data beyond the image, there just didn’t exist a good way to query these data. PDFs, Office documents and XML events sent between applications are other examples of valuable non-tabular but regularly arranged data we may want to analyze. 1. In nature, sediment is material which does not break down easily and slowly fills up the lake by piling up in the lakebed. Natural sediment is usually inorganic material such as silt and sand, but can also be include difficult-to-decompose material such as wood. Electronic sediment can be tremendously large blobs with little or no analytical value (does your data lake need the raw TIFF or the OCR output with the TIFF stored in a document management system), or even good data indexed in the wrong location where it won’t be used in analysis. Not having a maintainable storage strategy covering both the types and locations of data will cause your data lake to fill with heaps and heaps of electronic sediment. 2. Pollution is the input of substances which have an adverse effect on a lake ecosystem. In nature these inputs could be fertilizer, which in small amounts can boost the productivity of a lake while large amounts cause dangerous algal overgrowth, or toxic substances which destroy life outright. Because data lakes are designed to be scaled wide, it’s a temptation to fill them with data you don’t want to get rid of, but don’t know what to do with otherwise. Data pollution can also come from well controlled inputs but with misunderstood features or differing quality rules. Enterprise data are probably sourced from disparate systems, and these systems may have different names for the same feature, or the same name for different features, making analysis difficult. 3. Detritus in a natural lake is rotting organic matter. In a data lake, maybe it’s data you’re not analyzing anymore, or a partially implemented idea from someone who has moved on, or a poorly documented feature whose original purpose has been forgotten. Whatever the cause, over time, things which were once deemed useful may start to rot. Schema evolution is a fact of business–data elements in XML system event messages can be renamed, added or removed, and if your analytics use these elements, your analysis will be difficult or inaccurate. There may also be compliance or risk management reasons controlling the data you should store, and data falling outside those policies would also be sediment. Also, over time, the structure of your “unstructured data” may drift. 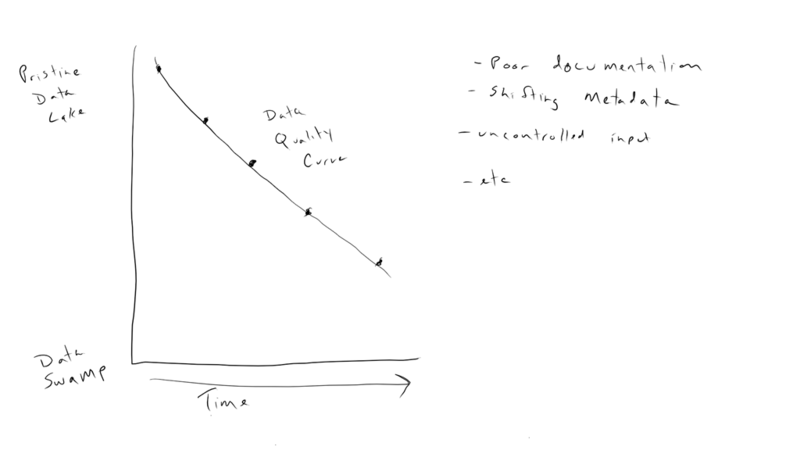 As factors affecting the quality of data in your lake, you can plot a declining “data quality curve” (mathematical models are being developed and may be covered in a future blog post). 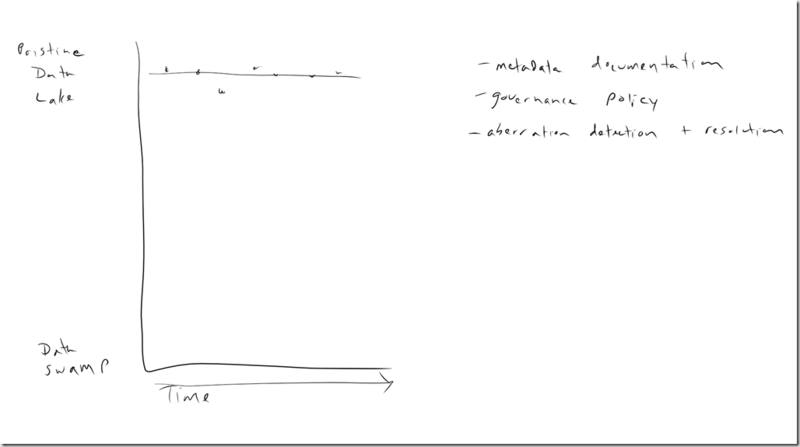 Fundamentally, the goal is to keep the data quality curve relatively horizontal. Below is an example of a mis-managed data lake, undergoing swampification. 1. Have a governance policy regarding the inputs to your data lake. A data lake isn’t a dumping ground for everything and anything, it’s a carefully built and maintained datastore. Before you get too far into a data lake, develop policies of how to handle additions to your data lake, how to gather metadata and document changes in data structures, and who can access the data lake. 2. Part of a governance policy is a documentation policy, which means you need an easy to use collaboration tool. Empower and expect your team to use this tool. Document clearly the structure and meaning of the data types in your data lake, and any changes when there are any. The technology can be anything from a simple wiki, to Atlassian’s Confluence or Microsoft’s SharePoint, to a governance tool like Collibra. It’s important the system you choose is low friction to the users and fits your budget. Past recommendations for data lake were to put everything in Hadoop and let the data models evolve over time. 3. Another part of a data governance policy is a data dictionary. Clearly define the meaning of the data stored and any transformations in your data lake. The maintenance and use should be as frictionless as possible to ensure longevity. Have a plan for the establishment and the ongoing maintenance of the data dictionary, including change protocols and a responsible person. If there is an enterprise data dictionary, that should be leveraged instead of starting a different one. 4. Explore technologies with the ability to explore schemas of what is stored and enforce rules. 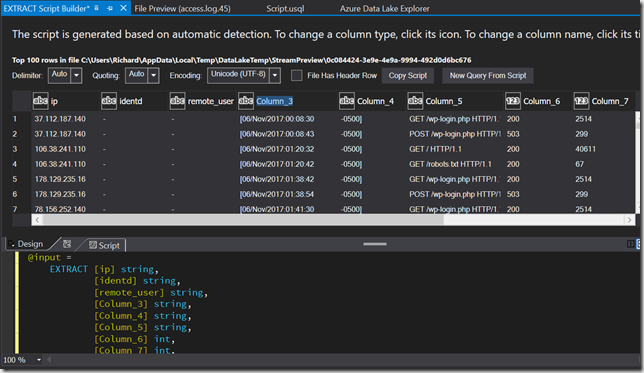 At the time of this writing, the Azure Data Lake can use PowerShell to enforce storage rules (e.g., “a PNG is stored outside of the image database”) and to explore metadata of the objects in the data lake. As the data lake ecosystem grows, continue to evaluate the new options. Products such as Apache Atlas, HCatalog, Zaloni and Waterline can collect metadata and make it available to users or downstream applications. 6. Remember schema evolution and versioning will probably happen and plan for it from the beginning. Start storing existing event messages in an “Eventv1” indices, or include metadata in the event which provides a version so your queries can handle variations elegantly. Otherwise you’ll have to use a lot of exception logic in your queries. 7. Control inputs. Maybe not everything belongs in your lake. Pollution is bad, and your lake shouldn’t be viewed as a dumping ground for anything and everything. Should you decide to add something to your data lake, it needs to follow your processes for metadata documentation, storage strategy, etc. 8. Sedimentation in a natural lake is remediated by dredging, and in a data lake that means archiving data you’re not using, and possibly having a dredging strategy. Although the idea behind a data lake is near indefinite storage of almost everything, there may be compliance or risk reasons for removing raw data. When effort is put into keeping a data lake pristine, we can imagine our data quality curve is much flatter. There will be times when the cleanliness of our data lake is affected, perhaps through personnel turnover or missed documentation–but the system can be brought back to a more pristine state with a little effort. Just as a natural lake is divided into depth zones (limnetic, lentic, benthic, etc. ), a data lake the data in a data lake needs a level of organization also. Raw data should be separated from cleansed/standardized data which should be separated from analytics-ready data. You need these different zones because, for example, customers usually don’t enter their address information in a standardized format, which could affect your analysis. Each of these zones should have a specific security profile. Not everyone needs access to all the data in the data lake. A lack of proper access permissions is a real risk. Implement data quality and allow the time for all data to be cleansed and standardized to populate that zone. This isn’t easy, but it’s essential for accurate analysis and to ensure a pristine data lake. It may also be beneficial to augment your raw data, perhaps with block codes or socioeconomic groups. Augmenting the original data changes the format of the original data, which may be acceptable in your design, or you may need to store standardized data in a different place with a link back to the original document.